Contest is Over. Thank you for participating! Very nice and different...got any more! Got me on this one Phil and I thought I knew everything. It is very beautiful, I think it is an Agate, but I am not a specialist....And I regret a lot to have couldn't buy some Morrisonite. Next time maybe...Charly. My Response: No sorry. :( Keep Trying !! I did'nt buy but I was one of the firsts to open your sale, and in Spain was 2.00 in the night!. I saved money for buy your next extra piece! Looking your cab, I guess is a Del Norte Thunder Egg Plume. My Response:No sorry. :( Keep Trying !! Woodward Ranch plume from Texas is my best guess, given the colors and clear chalcedony surround; but I doubt a northwest guy would feature a Texas agate. This really looks like Salina turtlebac/Plume from Utah to me. hmmmm....... I bet you're being too obvious and it's morrisonite. My Response: Hahaha! I wish! No sorry. :( Keep Trying !! Interesting cab. Looks to be some kind of moss agate. Looks almost like an unusual Del Norte, but I have to give up. I'm naming it myself... Awesome! My Response: No sorry, not Del Norte . :( Keep Trying !! Thought someone had guessed this, but now I don't see it. 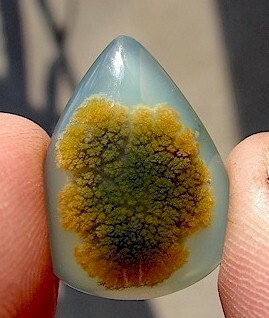 Unlikely, but maybe Maury Mountain Moss Agate? My Response: No sorry, :( Keep Trying !! My Response: Nope. Sorry Ron :( Keep Trying !! Anyone who can name this one deserves at least 50% discount on it. Your clue:"The rough never has fractures and never has pitting." Never is so restrictive as to imply "lab created": Fischer Stone? Other guesses named Agate: Copco (aka Jenny Creek), Nyedigger, Deming, Yellow Tree, Blue Moon Dendritic. P.S. looks nothing like any Montana Moss, but I submit it so others will not bother to do so. My Response: Fischer Stone YES! Chemically Induced Inclusions in Snake Skin Agate. Discovered by the late Dr. George W. Fischer. Probably Snake Skin Agate with a man made dendrite in it. My Response: Oh so close! Sorry Terry. What's the name of the stone? I know that's mean you probably knew the name of the stone anyway. So I'm sending something nice to you too.